1:11 p.m., Aug. 29, 2008--Last year enrollment services at UD processed applications from more than 25,000 individuals seeking to become members of the Class of 2012. 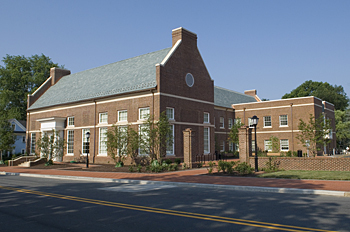 Now, the people who process applications for admission have a new home in the Enrollment Services Building located at the site of the former Visitor's Center at South College Avenue and Winslow Road. 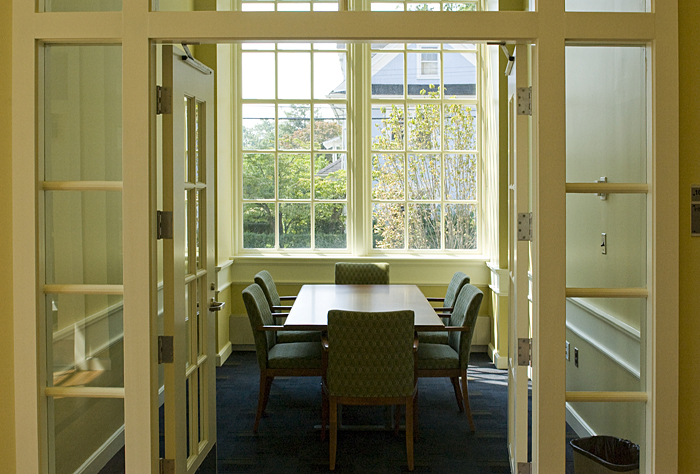 The 24,000-square-foot building also is home to the office of financial aid and the registrar's office. Last year UD Admissions hosted about 60,000 guests, including 20,000 prospective students who participated in various campus visitation programs, Jeffrey Rivell, deputy director in the Admissions Office, said. The Enrollment Services Building, which cost $12 million, includes two separate areas. 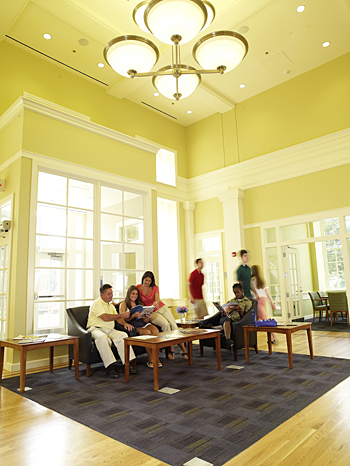 The one-and-a-half story public area at the front of the building includes a main lobby, presentation room and interview rooms and serves as the new Admissions Visitors Center. Prospective students can enter the lobby, move to the presentation room, where admissions staff will greet them and familiarize them with the University and the application process, and then can exit for campus tours conducted by specially trained students called Blue Hen Ambassadors. The remainder of the building houses the offices and functions of the three divisions. Walking tours of UD's central campus generally include a stop in a classroom building, as well as visits to the student centers, Morris Library and a residence hall and room, Rivell said. Having the offices of admissions, registrar and scholarship and financial aid in the same building helps strengthen the commitment that UD has made to serving students, Rivell said. “With the configuration of public areas, staff offices and processing areas, we are in a stronger position to collaborate and provide better service to prospective students and families going through the entire college selection process,” Rivell said. 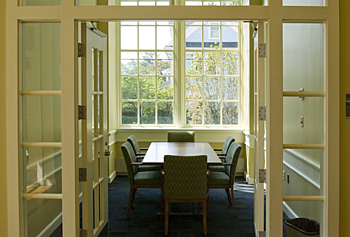 Architects for the Enrollment Services Building were Ayers Saint Gross, of Baltimore, who designed the Louise and David P. Roselle Center for the Arts and the new Laird Campus residence halls. Whiting-Turner Contracting Co. managed the construction. Larry McGuire, a senior project manager in Facilities-Planning and Construction at UD, supervised the project.